Tidal Toss is the third completed Mini-Game collaboration between Yoshiman and Mario Gamer, also their first entry in over a year. It is also the first mini-game compo entry led by Yoshiman. The concept started out as a joke from Yoshiman, however it was later taken seriously and turned into a full entry. The game took second place in the 25th mini-game compo. A reworked version was created for MFGG, and was released on May 25th. It was met with generally positive reviews. Just when Mario and Luigi think they have Bowser cornered, he escapes by destroying the Yoshi Island dam. 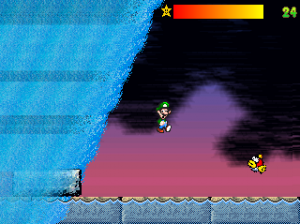 Luigi falls below and runs from his life from a huge tidal wave. Bowser Jr. appears in the game but is never mentioned. Clicking on each character on the title screen will cause them to speak. Placed second in the 25th Mini-game competitions. Wait for around 45 seconds on the title screen for balloons to show up. Click on the balloons to pop them. Click on seagulls on the scoreboard for a surprise. Currently Mario Gamer's favorite entry in a compo. This page was last edited on 29 December 2010, at 02:14.